People have lived in Olney from the days of the Roman Empire. In Saxon times, Olney was mentioned in a Charter of 979 AD as Ollanege (which is thought to mean 'Ola's Island'). Olney belonged to a descendant of the King of Mercia before becoming part of the Viking lands. Following the Conquest in 1066, Olney, or Olnei, was mentioned in the Domesday Book. A loyal supporter of King William The Conqueror was granted lands, including Olney. Upon the King's death, he backed the wrong man to succeed the King and was stripped of the land. The Battle of Olney in 1643 is a famous chapter in the story of Olney's history. During the Civil War between the Royalists and Parliamentarians, the latter held the area around Olney; Prince Rupert held Northampton for the King. Prince Rupert and his troops suprised the Olney forces and the Parliamentarians retreated to the bridge. Theirs was a defiant stand and they might have won decisively, but for a rumour that Cromwell's reinforcements were seen coming from Newport Pagnell. The Royalists retreated and the battle was over. The remains of some of those who died in battle were discovered in the last century and were re-buried in the Olney churchyard. The Battle of Olney Bridge is commemorated on a recently installed plaque in Emberton Park. During the 18th Century, Olney was a staging post for travellers. Horse-drawn coaches passed through taking people between Kettering and the Newport Pagnell Turnpike. It is said that by 1754 there were 27 inns in the town. This was also the home of poet William Cowper and writer, curate John Newton who wrote the 'Olney Hymns' together. See the entry on the Cowper and Newton Museum for more information. During the 19th Century, Olney was a poor community hit by outbreaks of cholera and smallpox. The census shows people employed in farming, shoemaking and lace industries or in shops or businesses like butchery, bakery, brewing, carpentry and building. "From house to house the burning masses continued to be borne by the wind, till several dwellings and outbuildings, barns, and two or three farm-yards, were enveloped in flames. The three parish engines, aided by two from Newport Pagnell, and one from Yardley Hastings, all worked by able and willing hands, did their utmost, but could not be ubiquitous; and the fire made its way from ridge to ridge, till some twenty or thirty houses on the eastern side and some ten or twelve opposite, together with a considerable number of buildings in the rear, outbuildings, and a large quantity of hay, beans &c., were destroyed, or rendered useless; one-sixth of the whole number of houses in the town being burnt down or seriously damaged". In 1872 the opening of the Northampton to Bedford railway line allowed people to seek better pay in the industries in those towns. With greater industrialisation, shoe factories were built in the town and replaced the small cottage workshops. A shoe industry of sorts continued after Word War I until the 1960's. 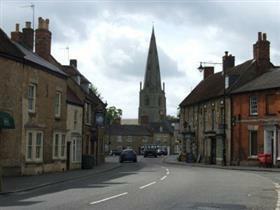 Olney is now a vibrant market town, with many people commuting to nearby towns for work. It's famous for the yearly pancake race which started here hundreds of years ago. Many local people know it as a place with a strong sense of community and as a safe and prosperous town to live.